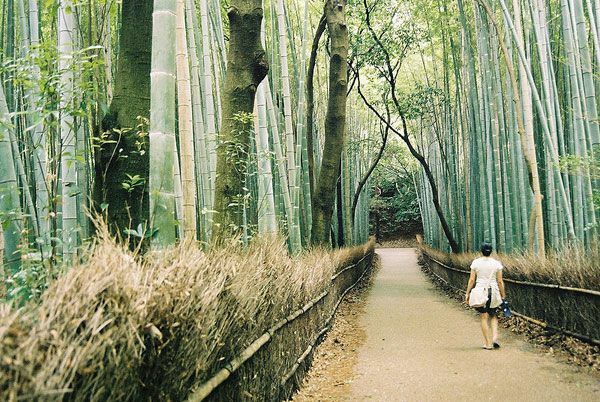 We take a closer look at the enchanting Arashiyama Bamboo Forest. The Japanese culture has a long tradition of living in harmony with their surrounding landscape. To them, nature is seen from a wider philosophical understanding and is treated with admiration and respect. 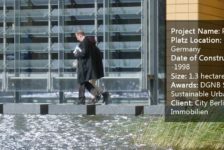 Although the country is highly developed and industrial, the perception of the role of the environment has allowed for nature to become part of the city fabric. 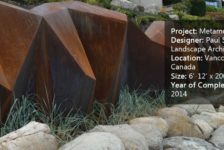 Furthermore, their connection with the land involves an understanding of natural resources and the potential benefits they can provide for the country. 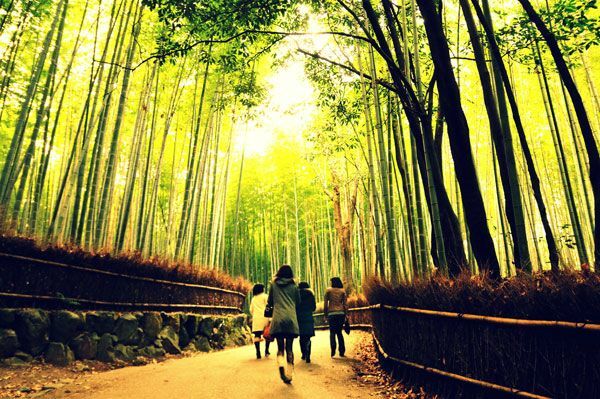 Arashiyama Bamboo Forest (also known as Sagano Bamboo Forest) is a perfect example of this harmonic relationship. 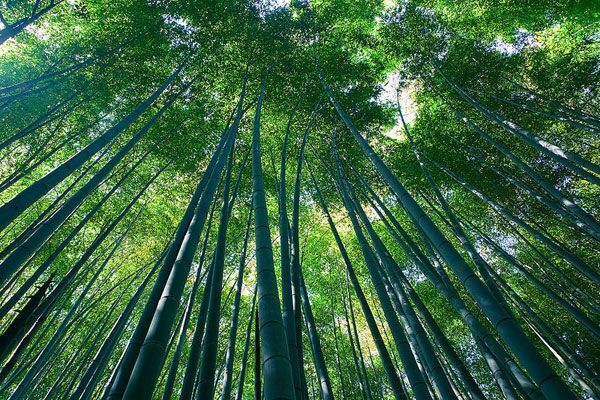 Bamboo has a long history of Japanese myths and legends and the forest is thought to be planted to protect the temples from evil. 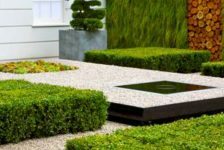 The exotic grass is also seen as a symbol of strength, drawing from its natural attributes of strength and durability. 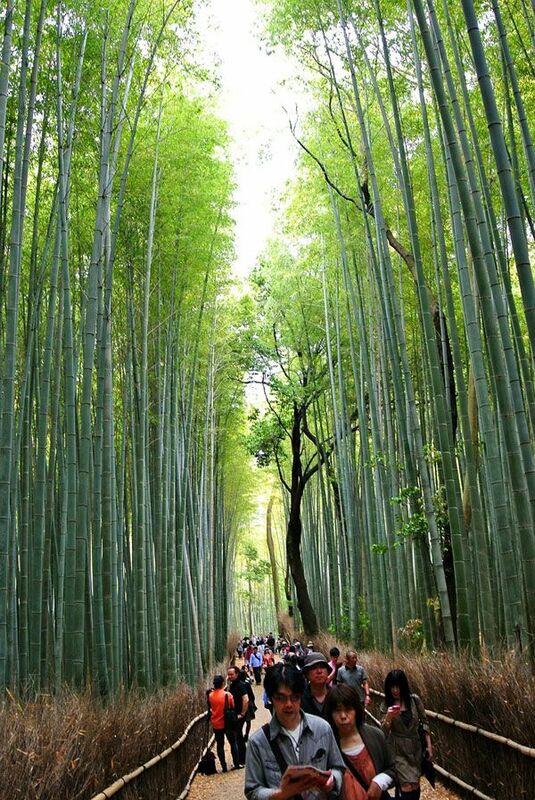 Arashiyama bamboo forest is located in the Arashiyama district of western Kyoto. For centuries, this area has been a popular destination for people to experience the beauty of the landscape and it is particularly breath-taking during autumn and cherry blossom season. The forest sits on the edge of the city below the mountains and its 16 square kilometres of dense bamboo contrasts dramatically with the surrounding urbanity. A Pathway in The Forest What makes this forest one of Kyoto’s most popular tourist destinations is the pathway that cuts through the dense vegetation, transporting visitors into a landscape of soaring bamboo stalks. 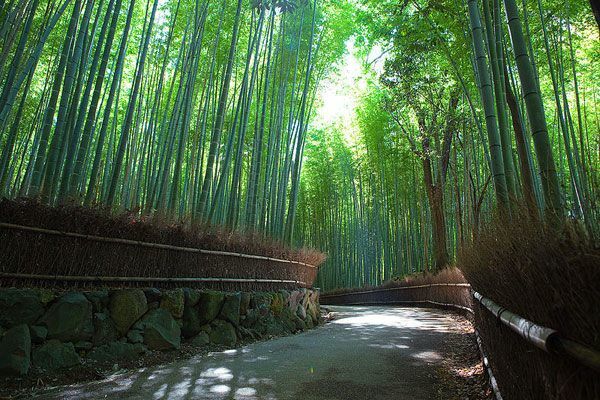 The pathway is approximate 300m long and is accessible directly from the main street of Arashiyama. 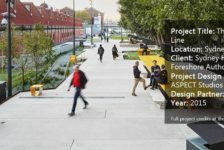 Its generous width accommodates both pedestrians and cyclists, allowing people to experience the landscape at their will. It is a serene and quiet place and even though it can get extremely busy during peak tourist season, the sense natural calm and the connection to nature is maintained. Although there is no knowledge of any clear design intent, the curvilinear pathway and its contrast to the bamboo has a sense of balanced aesthetic. The beauty of the pathway is in the simplicity: natural stone combined with a continuous railing of dried bamboo, edged by straight bamboo stalks reaching almost 50m into the air. Visitors can simply stroll along the pathway or can experience the cultural connection with the landscape through visits to a teahouse, shrine and temple along the way. 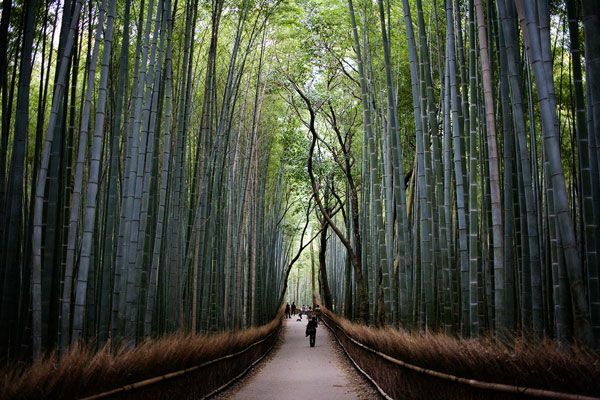 Photogenic Nature Arashiyama Bamboo Forest is one of the most photographed sites in the world. 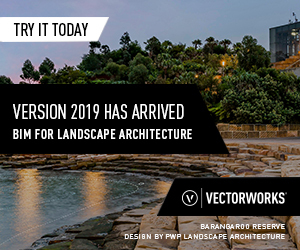 The natural vegetation creates a striking scene of tall and straight bamboo stalks which contrasts to the plain and unadorned pathway. During the day thin slashes of sunlight are projected through the densely packed grove while at night footlights create an eerie yellow glow. The forest is a place of natural yet ordered beauty. Natural Music The forest is not only a place for experiential visual beauty, but creates a unique landscape experience through sound. As the wind blows against the bamboo a soft resonating tune is produced, masking out city noise and creating a natural music experience. This sound as been added to the list of “100 soundscapes of Japan” by the Ministry of Environment as a means to encourage locals to connect with nature through all their senses. 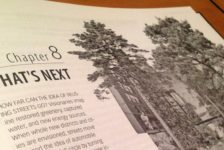 Role of Bamboo Bamboo is the fastest growing plant on earth, making it a truly sustainable product. In fact, bamboo can regenerate its full mass after being cut in only 6 months – while a tree will take 30 to 50 years!. 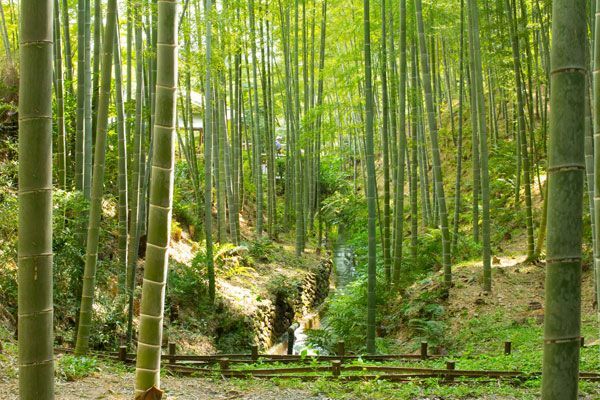 This allows Arashiyama Forest to not only function as a tourist and cultural destination, but continuous harvesting takes place for its use as a local natural resource. 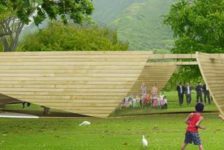 The bamboo is harvested for products such as cups, boxes, baskets and mats and is used as a structural material due to its extremely high tensile strength and flexibility. Community Stewardship Since 1967 bamboo forests have been recognised as important sustainable and environmental resources and there is strict legal control to preserve their gross area. The location of the forest in Arashiyama has meant that the local community has become environmental stewards, ensuring maintenance and conservation of the forest is maintained. 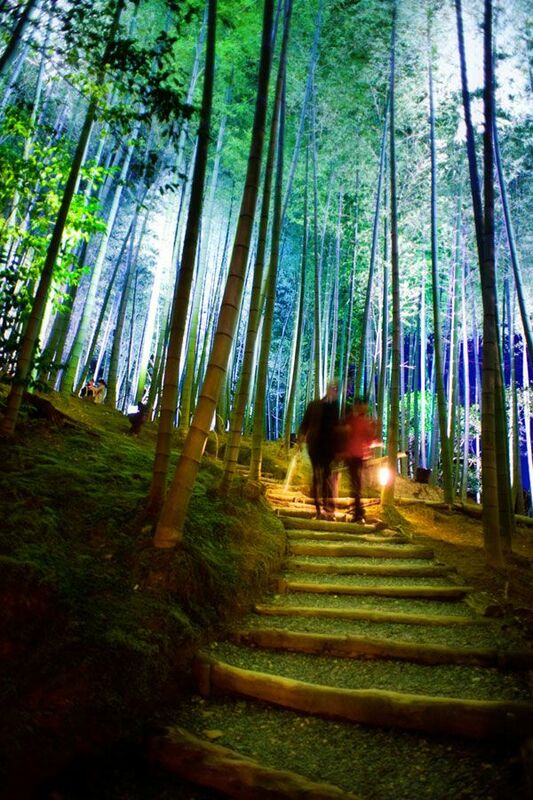 The forest has even become part of their cultural traditions and each year in mid December a night walk is held as part of the Kyoto Arashiyama Hanatoro festival where 2500 oriental lamps are lit along the pathway as the community celebrates their landscape.